Macular edema is the most important cause of decreased vision in patients with branch retinal vein occlusion (BRVO).1 Treatment options for macular edema in these eyes include intravitreal injection of anti-VEGF agents or steroids or the dexamethasone intravitreal implant 0.7 mg (Ozurdex, Allergan). Subthreshold micropulse laser photocoagulation (SMLP) may also be effective for the same indication. • Micropulse laser can be useful in treatment of macular edema in BRVO patients whose disease is refractory to anti-VEGF therapy. • Laser therapy may reduce cost and risk for some patients, making it a more effective and convenient option. This report attempts to highlight the possible role of SMLP in effective treatment of macular edema in the era of anti-VEGF therapy. A 43-year-old white male nonsmoker presented with diminution of vision due to macular edema secondary to inferotemporal BRVO. The patient was under treatment from July 2012 to October 2016. He had no medical history of hypertension or diabetes. Between July and October 2012, he was treated elsewhere with topical nonsteroidal antiinflammatory drugs. Figure 1. Baseline OCT of a patient with CME with CMT measuring 631 μm. Figure 2. A good response was seen at 1 month after the patient’s first anti-VEGF injection. OCT shows reduction in CME with CMT of 156 μm. Figure 3. Recurrence of macular edema was seen 2 months after the first injection. CMT measured 702 μm with loss of foveal contour and large cystic spaces. When he presented at our institution in October 2012, he reported diminution of vision and symptomatic metamorphopsia. His Snellen BCVA was 6/20 in the left eye and 6/6 in the right eye. Anterior segment examination was within normal limits, and IOP measured 12 mm Hg on applanation tonometry. Both eyes were phakic with clear lenses. On fundus examination, the right eye fundus was within normal limits. The left eye fundus showed resolving inferotemporal BRVO with significant macular edema. OCT documented cystoid macular edema (CME) with central macular thickness (CMT) of 631 µm (Figure 1). The patient was informed about the nature and course of the disease, and treatment options were discussed. After giving informed consent in November 2012, the patient underwent his first intravitreal anti-VEGF injection in the left eye, with bevacizumab (Avastin, Genentech) 1.25 mg in 0.05 mL given under aseptic conditions. All injections were performed by the same surgeon without complications. At 1 month follow-up, OCT showed reduction in CMT to 156 µm (Figure 2). BCVA had improved to 10/20 in the left eye. Two months later, OCT showed recurrence of edema with CMT of 702 µm, and a second injection of bevacizumab was given (Figure 3). A similar cycle of treatment and recurrence occurred seven times. Recurrence was defined as a 30% increase in CMT after initial reduction. Figure 4 shows the patient’s inconsistent improvements and intermittent recurrences. Figure 4. A timeline of events and interventions. Figure 6. At 30 months’ follow-up, OCT shows a maintained foveal contour with no evidence of macular edema and CMT measuring 84 μm. After the final injection, CMT was 148 µm, and OCT showed the presence of cystic spaces suggestive of CME (Table). Therefore, we decided to try performing SMLP with yellow laser (IQ577 Laser System, Iridex) over the macula (Figure 5). The laser was used in micropulse operating mode with the following parameters: power 380 mW, exposure time 200 millisecond, and spot diameter 200 μm. Approximately 637 laser spots were applied, covering the central macular area. At 1-month follow-up, CMT decreased to 102 µm with decreased cystic spaces on OCT. At our final follow-up visit at 30 months, the patient’s BCVA had improved to 12/20, and OCT demonstrated CMT of 84 µm with maintenance of foveal contour and absence of edema or cystic spaces (Figure 6). A literature review found a limited number of reports analyzing the use of micropulse laser for the treatment of macular edema secondary to BRVO. In 2006, Parodi et al compared the use of subthreshold grid laser treatment (SGLT) using micropulse diode laser with threshold grid laser treatment for treatment of macular edema secondary to BRVO.4 After 1 year of follow-up, there was no difference in mean foveal thickness, total macular volume, or VA between the two groups. After 24 months, VA was better in the SGLT group. With advances in development of the SMLP method, there has been a reduction in complications associated with use of conventional laser photocoagulation. SMLP is designed to selectively target the RPE while having a minimal effect on the sensory retina and choroid. There are several lasers capable of performing SMLP, including models from Quantel Medical operating at 577 nm wavelength; Iridex at 532 nm and 577 nm; and OD-OS at 577 nm. In the case reported earlier, as noted, we used the Iridex IQ577. Parodi et al conducted a prospective, randomized study comparing SGLT and intravitreal bevacizumab injection in the treatment of recurrent macular edema secondary to vein occlusion.7 They found that intravitreal bevacizumab provided significant functional and anatomical improvement, whereas SGLT failed to demonstrate any beneficial effects. They concluded that intravitreal anti-VEGF treatment was a better option in recurrent macular edema secondary to BRVO that has already been treated with conventional grid laser photocoagulation. Repeated injections of anti-VEGF agents can lead to local complications including increased IOP, development of secondary cataract, retinal detachment, and endophthalmitis. There is also a rare possibility of systemic side effects such as cerebrovascular events.8 Concern regarding the medical expenses associated with repeated injections will increase in the future. Therefore, attention has recently been focused on the development of other therapeutic methods that can suppress the recurrence of edema rather than rely on anti-VEGF monotherapy alone. The BRIGHTER study compared intravitreal ranibizumab 0.5 mg (Lucentis, Genentech) monotherapy with intravitreal ranibizumab plus conventional grid laser treatment.9 At 6 months, the number of treatments required in the monotherapy arm was 4.8 ± 1.0, compared with 4.5 ± 1.2 in the combination arm. Good VA was obtained with fewer injections in the combination therapy arm. Terashima et al studied the efficacy of combination therapy of intravitreal ranibizumab and 577-nm yellow laser SMLP for macular edema secondary to BRVO.10 They found that the number of ranibizumab injections in the first 6 months was significantly greater in the ranibizumab monotherapy arm (2.3 ± 0.9) than that in the combination SMLP and ranibizumab group (1.9 ± 0.8; P = .034). VA in the combination therapy arm was better than that in the monotherapy arm, although the difference was not statistically significant. The number of cases in which macular edema was controlled with only one ranibizumab treatment was 36.4% in the combination therapy group and 20.8% in the monotherapy group. In the combination therapy arm, there were fewer recurrences (54.5%) than in the monotherapy group (75.0%). Based on our limited observations, it appears that SMLP may be effective in patients with macular edema secondary to BRVO, especially in refractory cases. In the case presented here, we saw no evidence of local or systemic side effects of anti-VEGF or laser therapy. We are aware that the outcomes of this single case report must be validated in a larger case series or a prospective clinical trial before its implications can be universally applied. Yet we believe that this report brings forth a new possibility for optimal management of recurrent macular edema in patients with BRVO who demonstrate a suboptimal response to anti-VEGF treatment alone. 1. Inagaki K, Ohkoshi K, Ohde S, et al. Subthreshold micropulse photocoagulation for persistent macular edema secondary to branch retinal vein occlusion including best-corrected visual acuity greater than 20/40. J Ophthalmol. 2014;2014:251257. 2. Su D, Hubschman JP. 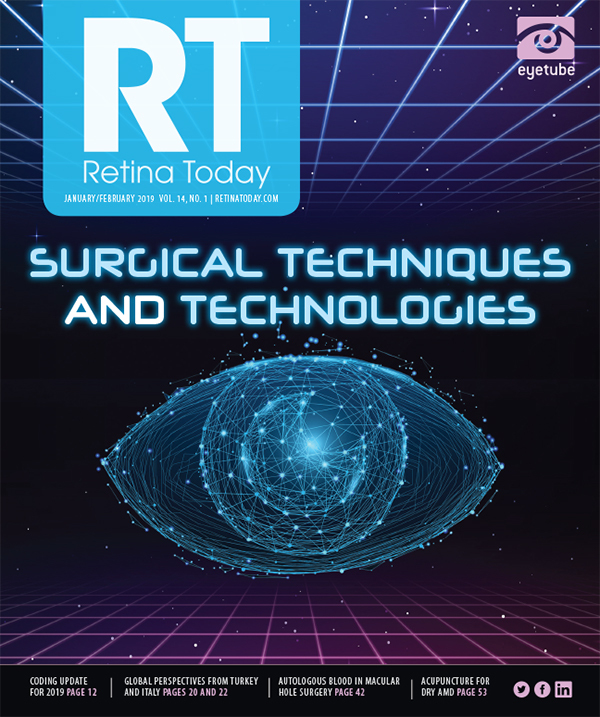 A review of subthreshold micropulse laser and recent advances in retinal laser technology. Ophthalmol Ther. 2017;6(1):1-6. 3. Flaxel C, Bradle J, Acott T, et al. Retinal pigment epithelium produces matrix metalloproteinases after laser treatment. Retina. 2007;27(5):629-634. 4. Parodi MB, Spasse S, Iacono P, et al. Subthreshold grid laser treatment of macular edema secondary to branch retinal vein occlusion with micropulse infrared (810 nanometer) diode laser. Ophthalmology. 2006;113(12):2237-2242. 5. Karagiannis DA, Karampelas MD, Soumplis VM, et al. Recurrence of macular edema in retinal vein occlusions after treatment with intravitreal ranibizumab (Lucentis). Can J Ophthalmol. 2011;46:486-490. 6. Hanada N, Iijima H, Sakurada Y, et al. Recurrence of macular edema associated with branch retinal vein occlusion after intravitreal bevacizumab. Jpn J Ophthalmol. 2012;56:165-174. 7. Parodi MB, Iacono P, Bandello F. Subthreshold grid laser versus intravitreal bevacizumab as second-line therapy for macular edema in branch retinal vein occlusion recurring after conventional grid laser treatment. Graefes Arch Clin Exp Ophthalmol. 2015;253(10):1647-1651. 8. Avery RL. What is the evidence for systemic effects of intravitreal anti-VEGF agents, and should we be concerned? Br J Ophthalmol. 2014;98(Suppl 1):i7-i10. 9. Tadayoni R, Waldstein SM, Boscia F, et al; BRIGHTER Study Group. Individualized stabilization criteria-driven ranibizumab versus laser in branch retinal vein occlusion: 6-month results of BRIGHTER. Ophthalmology. 2016;123(6):1332-1344. 10. Terashima H, Hasebe H, Okamoto F, et al. Combination therapy of intravitreal ranibizumab and subthreshold micropulse photocoagulation for macular edema secondary to branch retinal vein occlusion: 6-month result [published online ahead of print April 23, 2018]. Retina.